After starting operations at the Nielson Airport in March 1941, Philippine Airlines (PAL) began competing with the Iloilo–Negros Air Express (INAEC), which had been plying domestic routes since 1933. However, the outbreak of the Second World War on December 8, 1941, disrupted the operations of both airlines. INAEC planes were destroyed on the ground in Iloilo, while PAL planes were used by the military for supply deployment and personnel evacuation. The owners of INAEC revived their company under the name Far Eastern Air Transport Inc. (FEATI), which began operations on November 16, 1945, just two months after the war. Meanwhile, PAL resumed commercial operations at Nielson Airport on February 14, 1946, with First Lady Esperanza Osmeña gracing the occasion. This signaled the resumption of the competition between PAL and INAEC/FEATI. As the competition heated up, there ensued a “fare war” between the two. Not long after, however, the Philippine government intervened. 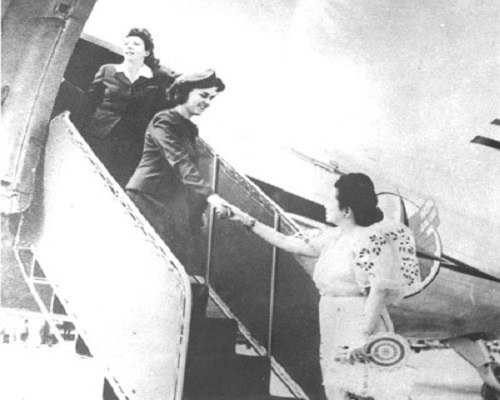 In November 1946, the government, after signing an air treaty with the United States of America, appointed PAL the country’s official flag carrier. By December 3 of the same year, PAL began flying to San Francisco. The government’s move proved disastrous to FEATI. On May 13, 1947, FEATI was bought by, and merged with, PAL. That same date marked PAL’s first flight to Madrid, making it the first Southeast Asian airline to fly to Europe. during a ceremony at Nielson Airport. This marked PAL’s resuming operations after World War 2. “Company History.” INAEC Aviation Corporation. http://www.inaec.com.ph/history.html. February 14, 2012. “Corporate Profile.” National Development Corporation. http://www.ndc.gov.ph/index.php?option=com_content&view=article&id=2&Itemid=2. February 14, 2012. Public Relations Department, Philippine Airlines. Wings for a Nation: A History of Philippine Airlines 1941-1982. Manila: 1983. By providing your email address, you are giving Ayala Foundation the permission to use it for legitimate, service-related purposes only. Makati Avenue cor. De la Rosa St. Copyright 2018 Filipinas Heritage Library.